For a long time past it has been the belief of eminent geogra­phers and scientists that the most important work of ex­ploration yet to be accom­plished lies in the Antarctic Continent. This subject has occupied a prominent place in the addresses delivered at the important gatherings of the leading geographical institutions of the world. It is for the pur­pose of giving some account of how this landing was effected that this article is written. The materials are gathered from the log of the Southern Cross, and fro m letters received, It is obvious that this account must end where the most import­ant work of the expedition begins; but from the fact that it is the first time such landing has been effected, and also because Mr. Borchgrevink and his, brave band have already encountered many dangers and adven­tures, it may prove interesting. 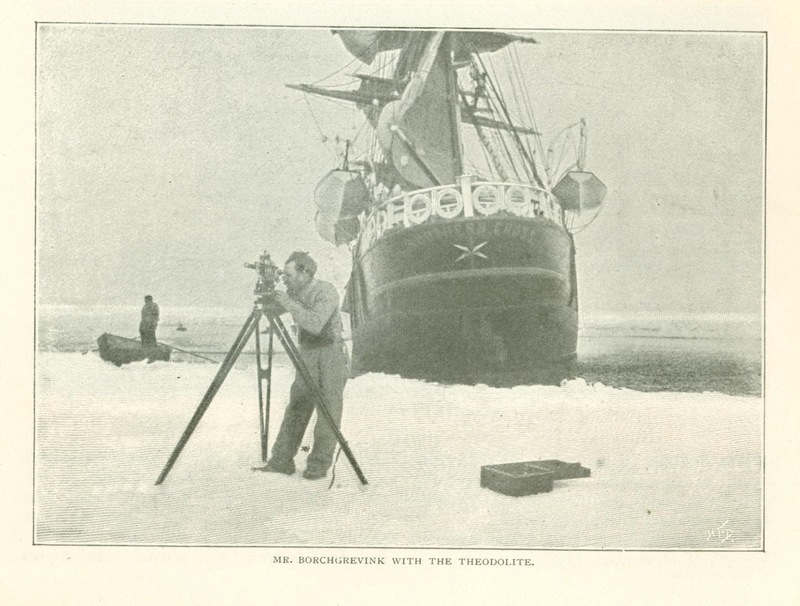 Mr. Borchgrevink was selected as leader of the expedition because of his enthusiasm for Antarctic exploration, his courage and determination, his study of the question, and because he himself had already five years before actually set foot on Victoria Land, though only for a few hours, and therefore knew something of the difficulties likely to be incurred in getting there. His chief officers are Captain Jensen, Sub-Lieutenant Colbeck, R.N.R., Mr. Hugh Evans, and Mr. Bernacchi (an Australian), having under their command a fine, stalwart crew. The Southern Cross was to have been entirely re­fitted in England, out owing to the great engi­neers strike here it was necessary to send her to Norway for the renewal of her engines and boilers. After this was completed the ship came to the Thames, and was for the rest - food stores, clothing scientific instruments, etc. - completely equipped in London. 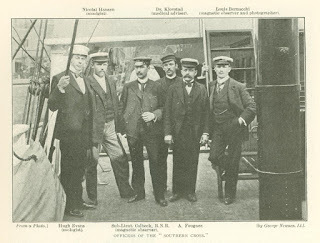 On the day before the departure a luncheon was held on board, presided over by the writer of this article, at which several eminent geographers and explorers were present for the pur­pose of giving a hearty send-off to the intrepid band who were to go so far and risk so much. 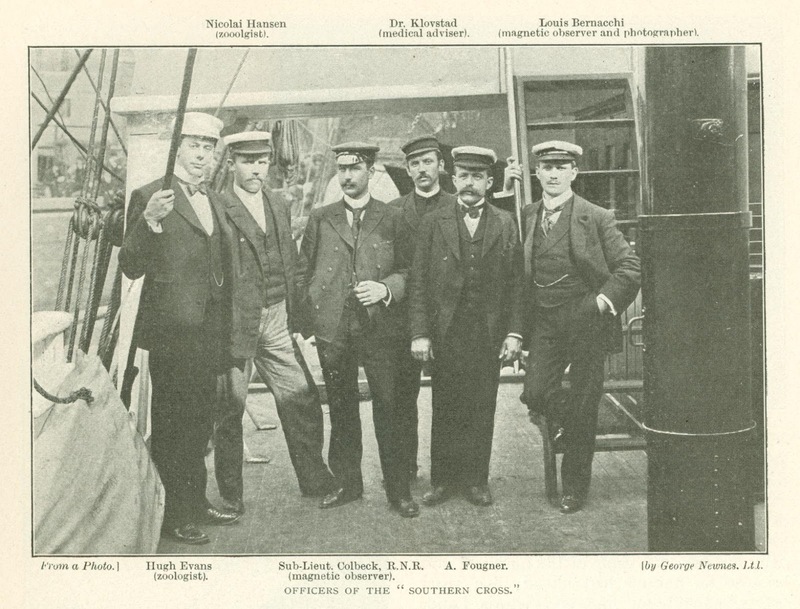 The Southern Cross sailed next day under the British flag presented to the ship by H.R.H. the Duke of York. It seems to have become known an down the river that this inter­esting vessel was starting on her bold enterprise, and very many ships displayed their bunting, and the crews assembled on deck to lustily cheer the Southern Cross as she steamed past. This last demonstration of kindness was much ap­preciated by all on board as a pleasing and, indeed, an affecting farewell. The voyage to Hobart Town was comparatively uneventful. On reaching that port they. were very heartily welcomed. The keenest interest in Antarctic research is felt in Australasia, as is natural from its geographical position. The Governor, His Excellency Viscount Gormanston, G.C. M.G., presided at a banquet in their honor, and parties and conversaziones and fetes were given to them, which must have been in striking contrast to the rough life they were about to commence. Mr. Borchgrevink writes with much gratitude of the kindness they all received at Hobart Town. The vessel left that port for Cape Adair on the 19th of December, 1898. On Friday, the 30th, she sighted the great ice pack in lat. 6I's 6 deg. south and long. J S3'S3deg. east - somewhat sooner than had been expected. The greatest enthusiasm prevailed on board, for the sight, to those who looked upon it for the first time, was one to fill the spectator with wonder and admiration. Some of the floes were several miles in diameter, and from 4 ft. to 8 ft. thick. The channels between them were very narrow, and at times closed up com­pletely. The danger to the ship was great; but the Southern Cross proved equal to her task, and came triumphantly out of ice ­pressures which would have crushed a less solid vessel like an egg shell. The 22nd and 23rd of January in especial were days of terrible anxiety. The ship was fairly buried in the ice; the great blocks rose to the level of the bowsprit; and the pres­sure of the floes was so stupendous as to lift the vessel bodily 4 ft. out of the water. 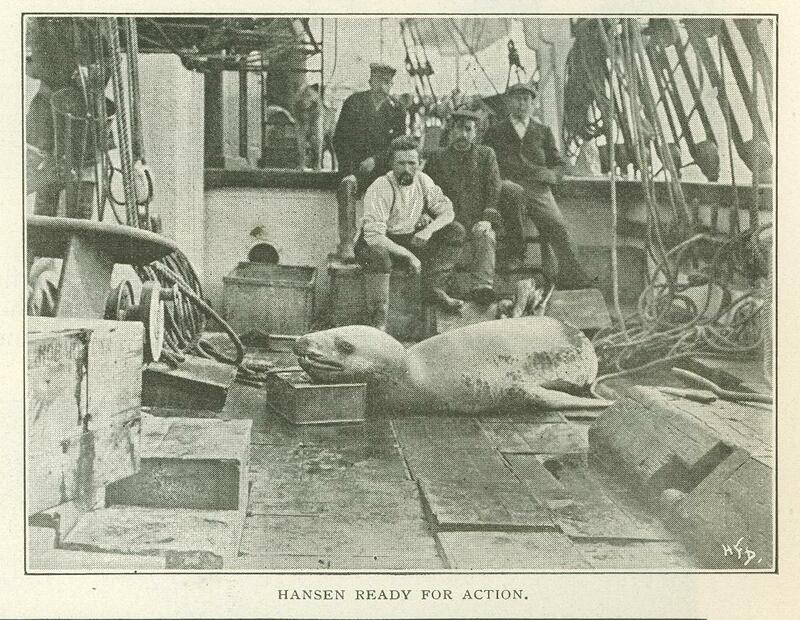 They were at that time off the coast of Balleny Islands. No more appalling scene of desolation can be imagined than those sinister and ice bound shores. At evening, however, gorgeous sunsets, which surpass description, glowing on iridescent floe and ice peak, lend them a wild magnificence of beauty which compensates for all. Nor were the adventurers without resources. Very valuable scientific work was done, especially in the zoological department. No fewer than a hundred and seventy-five rare birds' skins were prepared, many seals, including one of an entirely new species, were procured, as well as penguins and beautiful white petrels. More than a hundred species of various fauna were collected. Meteoro­logical and magnetic observations were made, deep-sea temperatures were taken, and a number of most interesting photographs secured. Still encompassed by the horrors of the ice pack, and making little progress, the ship remained for no less than forty-three interminable days! 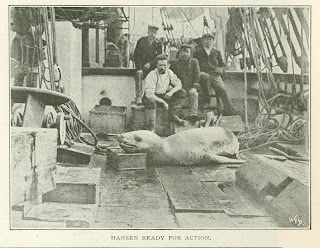 During the 8th, 9th, and 10th of February, the crew made strenuous efforts to reach open water to the north, and succeeded in doing so on the 11th. All progress was then made due east in order to re-enter the pack at a point likely to afford an easier transit, and on the 14th the brave ship once more thrust herself among the floes, At this place they were loose and broken, though the danger was still great. 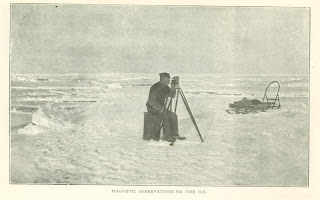 The sea was heaving with a heavy swell; masses of ice would crash into the ship's sides. with terrific force, causing the main­mast to quiver for some seconds with the shock. 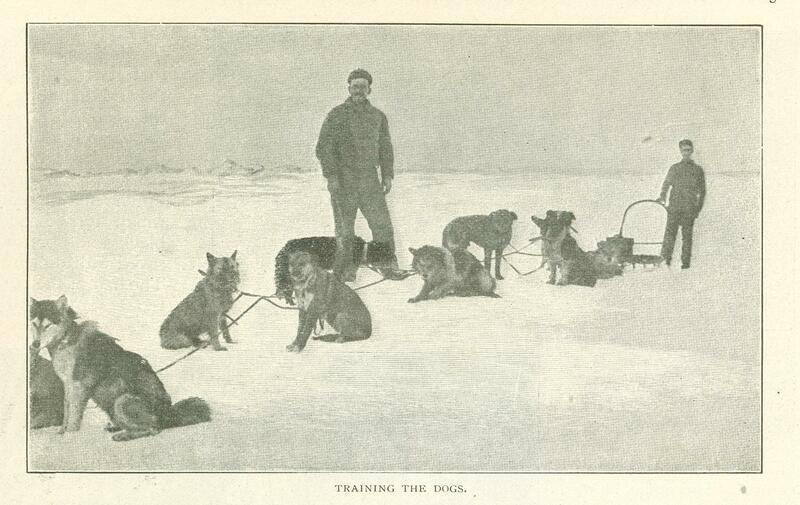 Towards midnight the ice be­came much scattered, and at five o'clock in the morning the vessel was again in clear water to the south, having been only a few hours in the pack. On February 16th Cape Adair was sighted. A terrific gale was blowing, and the ship was compelled to lay to that night under two half-top­ sails in a storm of blinding sleet, and with the decks and rigging covered thick with ice. Next day, the gale subsiding, they steamed into Robertson Bay, and for the first time in history, at ten o'clock in the morning, an anchor was let fall, in ten fathoms of water. In half an hour the staff were all on shore. On the beach were penguins, gulls, stone­ petrels, giant petrels; and many huge seals of an unknown species. Two of the adventurers, Mr. Evans and Mr. Bernacchi, started off to climb to the summit of the cape. The ascent, over a thousand feet, proved terrible, and they did not reach the top till midnight. But they must have felt full compensation in the thought that they were the first to set foot upon the summit of Victoria Land. The next few days were employed in land­ing stores and erecting huts. This was a task of no small difficulty and hardship. The vessel was at anchor in the bay, some 200 yards. from the shore and the workers were obliged to discharge the cargo in small boats, which were then pulled to the land, and the boxes carried through the surf by bearers waist deep in the icy water. But all kept well and "game," and in due course the stores, the scientific apparatus, the sledges, and seventy-five sledge dogs were landed safe and sound. But now a new disaster was before them. On the 23rd of February a great blizzard came on. It was a terrible experience. The wind rose suddenly and blew thousands of tons of snow upon the little camp. The gale blew with cyclonic force, and it was piercing cold­ 18 deg. below zero! Four members of the staff­ the doctor, Fougner, Colbeck, and Bernacchi - were on shore and could not reach the ship. The only shelter was the tent, which they were obliged to bury with stones and to lash with ropes, to prevent it blowing away. All that terrible night they were toiling in the blizzard to save the cargo from being washed away. Mr. Bernacchi got frost­bitten in the ears, which turned quite black, and were only saved with difficulty. The hair of the party froze into solid lumps, and the ice upon their beards took hours to melt, while their Clothes dashed with ice like coats of mail. The waves froze solid as they dashed upon the shore, and the water froze in the barrels, though they lay beside a roaring fire in the tent. A more awful experi­ence it would be difficult to imagine. The next afternoon they managed to get on board, where they found that their companions had also had a terrible experience. Stones from the mountain had been blown on board. The cable had parted during the night and the ship was driving ashore. They en­deavored to cut the main mast, but could not do so. They were forced to steam out. of the bay and, even then nothing could have saved the ship had she not proved herself remarkably seaworthy. On the 23rd it blew another storm, but not quite so strong. But the vessel again lost an anchor, and, driving ashore, bumped on the rocks four times with terrific force. By steaming full speed ahead they contrived to get her off, but a boat was smashed to atoms, and they had to steam for shelter to the other side of the bay, and to moor the ship with ropes to the edge of the glacier. 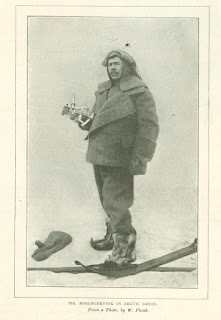 There they found good shelter, and on the afternoon of February 27th three members of the staff, Colbeck, Hansen, and Fougner, were permitted to go ashore for the purpose of climbing the great glacier, taking alpen­stocks, ropes, provisions, cognac, etc. They started at half past three and returned at midnight. They made some valuable dis­coveries, although they were not able to reach the top, attaining, however, an altitude of 2,300 ft., as indicated by the aneroid. At 1,600 ft. they discovered an abundance of moss, of three distinct kinds, exactly the same as reindeer moss in the north; and more important than all, near the bottom of the mountain they lighted on a huge quartz outcrop, which looked as if it contained gold! It was milky, with blue streaks and very heavy, and had walls of soft slaty matter. These discoveries gave them strong hope that their subsequent explorations will meet with great and valuable reward. 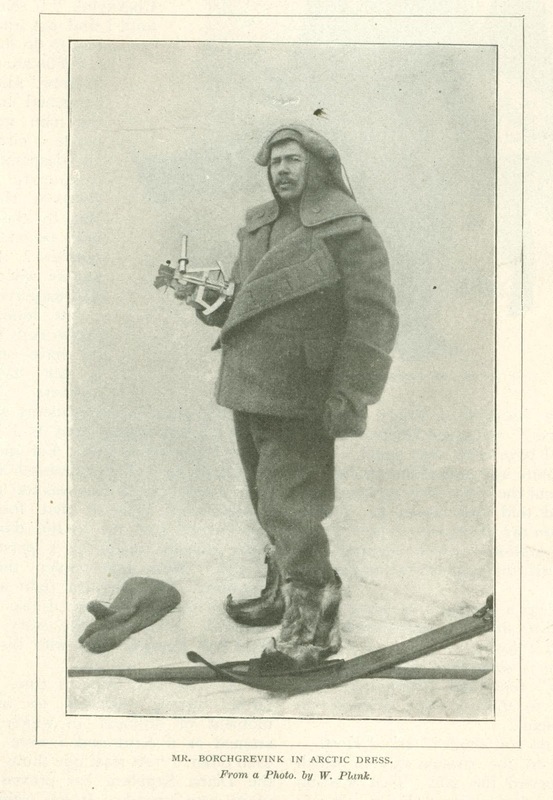 Such is a brief account of the experiences upon the Southern Cross up to February 27th. What has happened since then none but the brave band of ten determined men can know until January next. They are shut up in the ice, and no ship could till then approach near to the wonderful continent upon which they have voluntarily chosen to live for a year, during which time they will explore those unknown regions to the fullest extent of their powers. Our winter is, of course, their summer, and then the ice will break up and melt; and the Southern Cross, which has returned to warmer latitudes during the interval, will steam to Cape Adair once more. As they approach we can imagine the interest and anxiety to those on board to know whether they are to find the band sti1l muster­ing their full strength of ten souls, and the hopes they wi1l entertain. that the objects of the grand undertaking have been attained. I am sure these good wishes and kindly thoughts will be shared by thousands of us at home who admire the exercise of endur­ance, courage, and determination. Originally published in The Strand Magazine. October 1899.